Chronic Obstructive Pulmonary Disease is a long-term inflammatory condition that affects the pulmonary or respiratory system. This condition is irreversible and is slowly progressive. This condition may also be known as "chronic bronchitis". "However, long term airway inflammation may result from exposure to inhaled irritants..."
No definitive underlying causes of COPD have been determined. However, long term airway inflammation may result from exposure to inhaled irritants such as tobacco smoke, air pollutants or allergens, from dental disease, or from recurrent infections of the respiratory system. Are there other factors that can make COPD worse? Yes. Obesity is a complicating factor and will worsen the symptoms. Dental disease increases the risk that bacteria will travel from the mouth into the lungs and cause a serious secondary infection. What part of the respiratory system is involved in COPD? 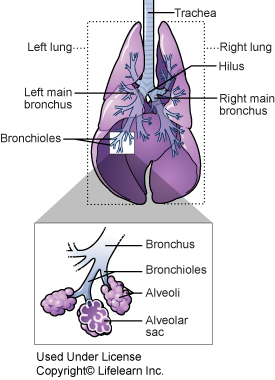 In general terms, the respiratory system is divided into two parts. The upper respiratory tract consists of the nose, nasal sinuses, throat and trachea or windpipe while the lower respiratory tract consists of the 'small airways' (bronchi and bronchioles) and the alveoli (the small air sacs deep in the lung tissue where oxygen exchange occurs). COPD is a condition of the lower respiratory tract. Initially it affects the small airways, although in advanced cases it will progress to also affect the alveoli. How does COPD affect the cat's lungs? In its early stages, COPD causes inflammation in the small airways. Persistent inflammation will cause blockage of the small airways and will ultimately result in reactive changes in the lungs, including dilation of portions of the small airways (bronchiectasis) or scarring in the lungs (pulmonary fibrosis). How fast do these changes occur? This condition develops slowly and progressively. Does it affect all breeds and ages of cat? COPD most often affects middle-aged and older cats. Some reports suggest that Siamese cats may be at a higher risk for developing this condition. In its early stages, the main symptom of COPD is chronic coughing, or coughing that persists for longer than a month. The cough is usually 'dry' or harsh, and gagging is common after coughing. As the disease progresses, the cat may appear to have less energy and may have difficulty breathing. Breathing may become noisy, and the pet may wheeze when exhaling. In later stages, the gums may develop a bluish tinge as a result of lack of oxygen. Cats with COPD rarely have a fever and usually their appetite remains normal. Could these symptoms be caused by something else? Chronic coughing may also be a symptom of a lung infection or some types of cancer. Although in people and dogs, coughing is a common symptom of heart disease, coughing is not usually a symptom of heart disease in the cat. Your veterinarian may suspect a diagnosis of COPD based on your pet's history and the results of a physical examination. When the chest is listened to with a stethoscope, "crackles" (harsh crackling or popping sounds) may be heard when the cat breathes in and out. With COPD, the heart rate is usually normal or lower than normal. A thorough medical history documenting the onset of the problem and its progression, any changes in the cat's home environment, or any other signs of illness in the cat, will be important to help rule in or rule out other diseases. The diagnostic work-up may include blood tests, radiography, bronchoscopic examination, and/or a procedure called tracheal washing. 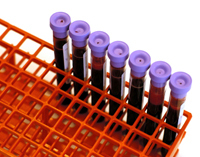 Samples collected by bronchoscopy or tracheal washing will be submitted for specific laboratory testing such as cytology (microscopic examination of cells), histology (microscopic examination of tissue samples) or bacterial identification and culture. The cat will usually require sedation or anesthesia for some of these procedures. Most cats with COPD are treated as outpatients. If the cat is experiencing severe respiratory distress, hospitalization for oxygen therapy and/or intravenous medication to stabilize the condition may be required. Specific medications that may be prescribed to treat COPD include bronchodilators to dilate the airways and help clear secretions, cough suppressants, antibiotics if there is evidence of a secondary bacterial infection and/or corticosteroids to decrease the inflammation and ease the coughing. Avoidance of irritants such as smoke or airborne allergens will help lessen the chance of relapses. Non-specific treatments for COPD may include diet modification to promote weight loss in the overweight pet. Your veterinarian may prescribe supplements that have antioxidant, anti-inflammatory or immune stimulant functions as supportive treatments. "Regular dental descaling, cleaning and polishing under general anesthesia is strongly recommended..."
It is important to maintain good oral health in the cat with COPD. Daily tooth brushing is extremely beneficial to these patients. Regular dental descaling, cleaning and polishing under general anesthesia is strongly recommended to minimize the chance that bacteria from the mouth will cause a secondary infection in the inflamed respiratory tract. What is the success rate for treatment of COPD? This condition is non-reversible and often is slowly progressive. Appropriate treatment will slow the progression of the disease and will relieve distressing symptoms. With proper management, most cats with COPD enjoy a normal life expectancy and an excellent quality of life. Relapses may occur when the seasons change or if air quality is poor. Adjustments to medication dosages may be necessary at these times. Consult our veterinary clinic for specific advice if this occurs with your pet.